Welcoming the exhibitors, President Dr. Eden Y. Woon described AIT as a great destination to hire potential employees. “AIT students are international in their background and thinking, and beside being fluent in English, they have undergone a rigorous education,” President Woon said. “Our students’ worldview is very broad, and this makes them ideal recruits,” he added. “Moving forward, AIT will become more global as it will have more exchange partners, offer greater internship opportunities, and be home to more visiting professors,” the President said. Introducing the event, Joan Carla Gonzales, Coordinator, AIT Career Center, informed participants that this was the twenty-fifth edition of the AIT Career Fair, which began in 2006. 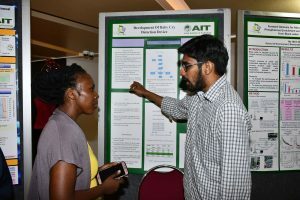 Alongside the Career Fair, a research exhibition of posters prepared by AIT students was organized at the same venue, showcasing a record 31 research exhibits. The best poster award was won by Wachiranon Chuenchart of Environmental Engineering and Management, followed by Tina Rodvong of School of Management (second prize), while the third prize was shared by Gautam Dadhich of Remote Sensing and Geographical Information Systems, Anuja Dahal of Food Engineering and Bioprocess Technology, and Apantri Peungnumsai of Remote Sensing and Geographical Information Systems. 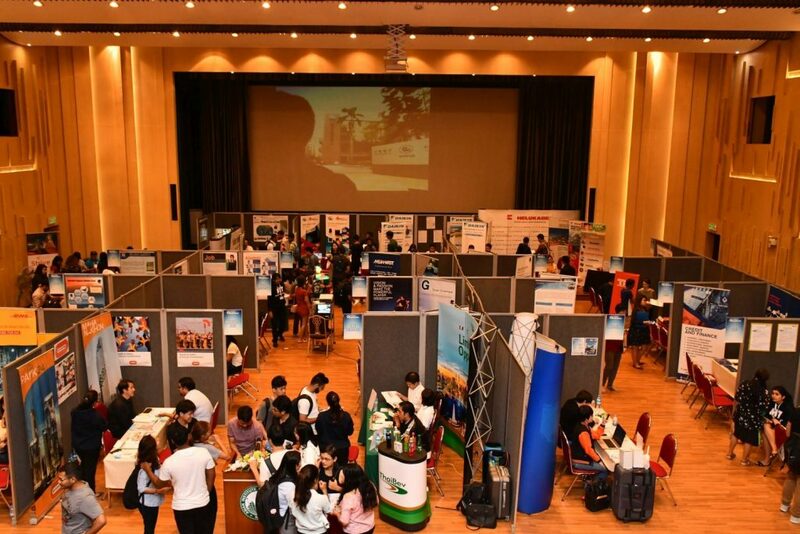 The exhibition displayed a wide variety of research ranging from engineering and environment to management. Companies participating in the Career Fair included Aeroklas Co. Ltd., Asia Pacific Petrochemical (APC) Co. Ltd., Bangchak Petroleum PCL, Bangkok Bank PCL, Biosci (Thailand) Co. Ltd., Bouygues-Thai Ltd., Cal-Comp Electronics (Thailand) PCL, Codium Co. Ltd., Consultants of Technology (COT) Co. Ltd., Daikin Industries Thailand Ltd., Deloitte Consulting Ltd., Denso International Asia Co. Ltd., DHL Supply Chain (Thailand) Ltd., Essem International Co. Ltd., Fabrinet Co. Ltd., Get7trips Co. Ltd., Gulf Energy Development PCL, Helukabel (Thailand) Co. Ltd., John Deere (Thailand) Ltd., King Mongkut’s University of Technology Thonburi (KMUTT), Leapfrog Technology Nepal, Ltd., Meinhardt Thailand Ltd., Pandora Production Co. Ltd., Panya Consultants Co. Ltd., Planet Barcode Co. Ltd., Regional Integrated Multi-Hazard Warning System (RIMES), Siam Makro PCL, Takahata Precision (Thailand) Ltd., Thai Beverage PCL, THK Co. Ltd. (Japan), Think Blue Data (TBD) Co. Ltd., and TOA Paint (Thailand) Co., Ltd. Of the twelve companies participating in the Career Fair for the first time, five organized job placement interviews for AIT students. A birds-eye view of the AIT Career Fair.